quarrygirl.com » Blog Archive » vegan cinco de mayo in los angeles! vegan cinco de mayo in los angeles! do you live in LA and wanna celebrate the 149th anniversary of the mexican army’s victory over french forces at the battle of puebla with some craft beer and amazing vegan food?!?! if you answered “yes” to that question, you’re in luck! 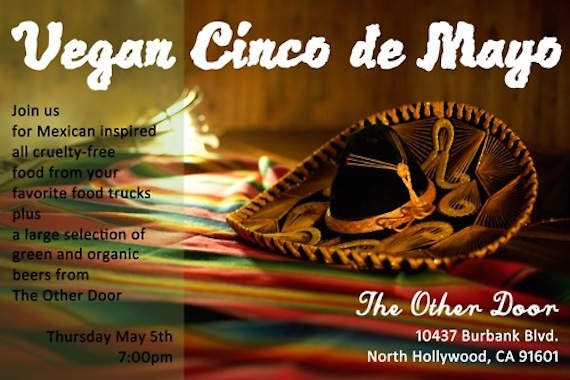 this thursday night, get ready to throw your hands up at los angeles’ very own vegan cinco de mayo pary, which will take place at the other door bar in burbank from 7pm-2am. like any worthwhile vegan event, there will be tons of food for sale. look out for cuisine provided by some of our favorite vendors including mama’s hot tamales, doomie’s, mandoline grill, fresh fries, and the frankenstand. there will be a great beer selection, and chicavegan.com will be selling vegan cupcakes to benefit her peruvian vegan restaurant project. you really have no excuse not to come to this. it’s on all evening, there’s no cover charge (you just have to pay for beer and food), and tykes that are under 21 can still enjoy the food trucks (which will be set up in the parking lot). i have been looking forward to this for a month now… almost as much as the next beer fest!!! One historical correction: it was the Mexican Army of Benito Juarez who defeated the French at Puebla in 1862, not the Spanish. Viva Mexico! thank you! i had mexican originally in the post….then someone on Facebook convinced me i was wrong! gah. The food was good and I stuffed myself with 2 cupcakes, a tamale with rice and beans, 3 tacos and finally a large order of fresh fries. However, I think they should have had some Cinco de Mayo music. Wohooo Vegan Cinco De Mayo!